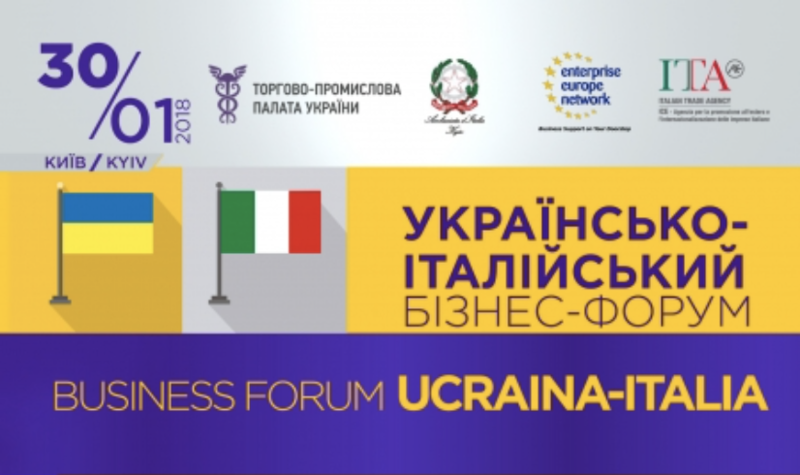 On January 30, 2018, the Ukrainian-Italian High-Level Business Forum will be held at the Ukrainian Chamber of Commerce and Industry in the framework of the official visit to Ukraine of the Minister for Foreign Affairs of the Italian Republic Mr. Angelino Alfano, who will join the event with the Minister for Foreign Affairs of Ukraine, Mr Pavlo Klimkin. Government officials, state agencies and associations, as well as Italian and Ukrainian companies will attend the Forum. Co-organizers of the event are the Ukrainian Chamber of Commerce and Industry and the Embassy of the Italian Republic in Ukraine with the support of the Ministry of Foreign Affairs of Ukraine. The program includes a plenary session to be focused on main topics, in particular energy, energy efficiency, agro-industrial complex, infrastructure and SMEs, with the aim of discussing state, prospects and priorities of Ukrainian-Italian economic and investment cooperation, conditions and advantages of doing business in Ukraine and Italy. A Business to Business (B2B) session will follow, to facilitate meetings and exchange between Ukrainian and Italian business representatives.